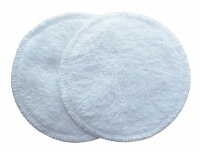 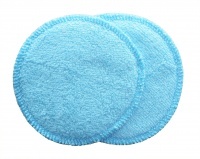 Wee Notions Breast Pads come in two sizes - 10cm diameter and 12cm diameter. 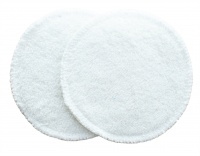 They also come in two types - Two Layer Breast Pads and Three Layer Breast Pads. 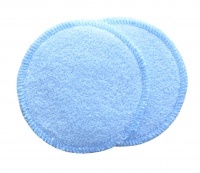 Two Layer Breast Pads - Have one layer of Bamboo Towelling which sits next to your skin and a layer of PUL which acts as a waterproof layer. 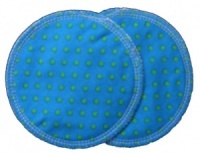 The PUL backing has a poly-cotton layer bonded to the PUL to help the pads to stay put. 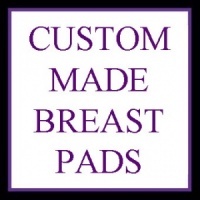 Three Layer Breast Pads - Have the same Bamboo towelling and PUL backing that the Two Layer Breast Pads have but they also have a choice of fabrics that you can choose to have next to your skin and therefore over the top of the bamboo towelling layer. 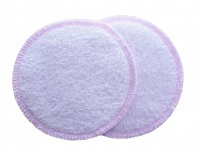 The choice of fabrics for the third layer are Minkee, Cotton Velour, 100% Cotton Limited Edition fabric, Organic Cotton Jersey, Organic Bamboo Velour or Cuddlesoft.